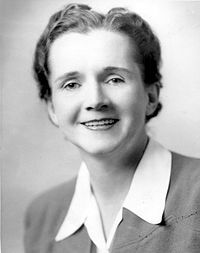 Over at The Guardian at the moment there is a debate occurring about Rachel Carson and Silent Spring and how influential they were – http://www.guardian.co.uk/global/blog/2012/sep/27/rachel-carson-silent-spring-legacy. Whilst the author of this blog, and the blog itself gets a (brief) mention, it is fitting that Carson and her work are receiving the recognition they deserve. Fifty years ago today the book first appeared in the United States, starting a cataclysmic wave of debate about pollutants and the environment which we are still having today. Carson, modest and humble, made a stand and got vilified for it. She wasn’t the first, nor was she the last. But, at least to most environmental historians (although this is changing somewhat), she is seen as starting the modern environmental movement. I think she deserves that credit.